London Mayor Boris Johnson threw his weight on Sunday behind the campaign to leave the European Union, dealing a blow to David Cameron by increasing the chance British voters will ditch membership in a June referendum. In a move that electrified the referendum campaign by pitting one of Britain’s most charismatic politicians against the prime minister, Johnson said Cameron had failed to deliver fundamental reform with an EU deal struck on Friday. Johnson, a political showman whose buffoonish and eccentric exterior is thought to mask a fierce ambition to succeed Cameron, said he loved European culture, civilization and food but that the European project was in danger of getting out of democratic control. “The last thing I wanted was to go against David Cameron or the government, but after a great deal of heartache I don’t think there’s anything else I can do. I will be advocating Vote Leave,” Johnson said this 20 minutes after texting the prime minister of his decision. Johnson, who has been the mayor of London since 2008 and a member of parliament for Cameron’s Conservative Party said he had wanted a better deal for the people to save them money and to take back control. Sterling fell in Asia as concern grew that Britain would quit the EU. The pound fell around 1 percent against the dollar, euro and yen. Johnson, 51, said he would not take part in debates against members of his own party. But his decision gives the “out” campaign a de facto leader who is one of Britain’s most high-profile politicians. Betting odds of a British exit rose to a 33 percent chance from about 29 percent, according to bookmakers. 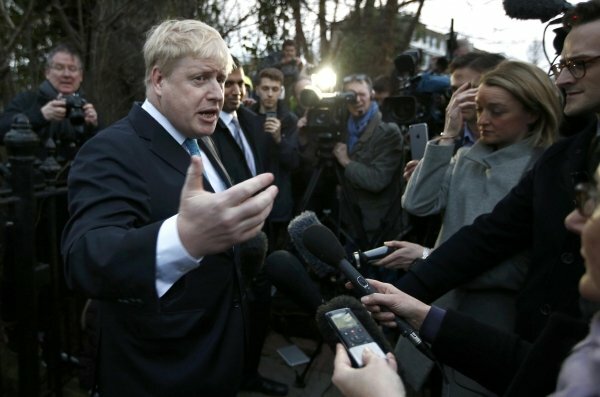 Johnson dismissed questions from reporters about whether joining the campaign to leave the EU was the first step toward a bid to succeed Cameron. On the contrary, he said with a smile, Cameron should stay no matter who won the June 23 referendum. But if Britain opts to leave, Johnson would be a leading candidate to succeed Cameron.